In order to find out what kind of issue the Arctic is on the Web, we have let Google find the most popular hits when searching very broadly on "the Arctic". What appears is a dominating climate issue as shown to the right. More precisely, what we did was to sort out the 15 pages starting from the top 100 results that Google returned, when we googled "the Arctic". We left out pages that showed up as default, dealing with Antarctic, Arctic Monkeys etc. We "googlescraped" these pages with eight words, which were chosen in accordance with our existing knowledge of the Arctic controversy. The word cloud to the right shows by size of each word, on how many sub pages each word was mentioned, at the chosen sites. Three of the words: oil, dispute and seabed were not mentioned at all, which explains that only five words are showing on the map. Two other words: indigenous people and conflict are barely visible because of the low frequency. 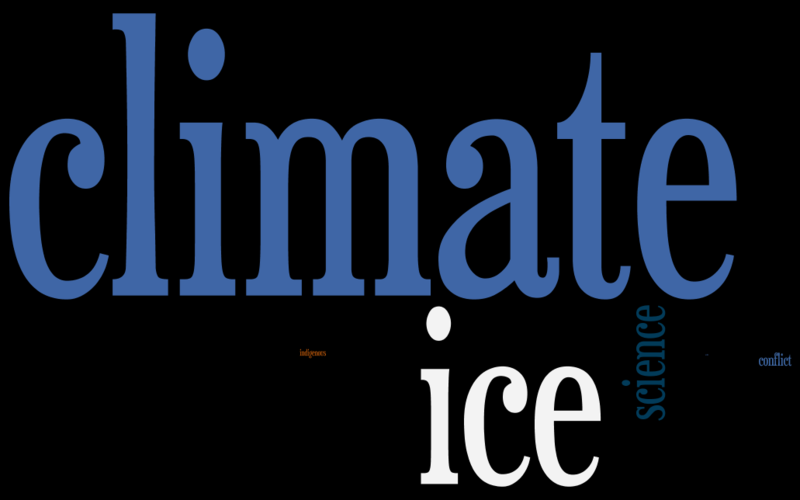 This leaves us with the three visible words where climate dominates quintessentially. The general public stemming from "the Arctic" on the Internet is a climate-concerned audience. The scientific dispute that we have chosen to map by this website is not attended by a broad public interest.